Harbinger league has been available to POE players for nearly twenty day. Many of them have played this challange league already and understand the league to a great extent. Gm2v also keep close attention to the league and to make more players perform better in the game Gm2v provides cheap & secure PoE orbs in offcial website. As unsual, players give both positive and negative feedbacks on it, which is not surprising. Howerver, GGG said that recently the league is amazing which raised a heated debate among players. In fact, the Harbinger League has many improvements and attractive parts. First, the new orbs are actually nice. Harbinger and Horizon orbs open a lot of new progression options, annulment crafting possibilities. Ancient orb is fun. Second, beachhead is fine. It's a beautiful map, harbinger orbs are cool, even if you don't get a beachhead you still gain an upgrade, it's the harbinger fights and some aspects of them, that wears it down a bit. Third, PoE has become an efficiency-driven game. Pack size feels good, speed feels good, difficult events feel good. Breaches are amazing, because they're short, fairly dangerous and interesting encounters, with unique rewards. You don't encounter them all the time. But when you do, you feel good. Harbingers can use some of that magic. This league and the current state of the game aren't is not if you compare it to how it was in the beggining. However, in my opinion, there are still more or less problems in this league which many players criticized. In fact, criticizing the game is what keeps it going foward. If everyone loved and thought 3.0 was perfect and everything was great, the game would probably go stagnant because there's nothing to change. First, there are too many single encounters instead of harbinger groups. I would like to describe it with the words a players used: it's like an Elreon mission. Nearly nothing harbingers do in maps is dangerous. You only feel the danger from harbingers in red maps especially if you run them with already rippy mods. At most time, it's just tedious and annoying. My advice is that giving harbingers the essence treatment - I'd prefer to find small groups of harbingers in maps (2-4, rarely more), but encountering them less overall to make the encounters memorable and dangerous. I want to get swarmed by things, not tickled. Harbinger groups would also only drop currency, upon killing the whole group. This would also allow them to drop more loot, even full orbs and feel significant. Second, Harbinger abilities pose little to no threats in maps. I think Harbingers don't zone at all. Breach really excelled there - you had to position yourself correctly there, because breach had a lot of dangerous AoEs. I really feel like harbingers can use the same. For example: Summon blue beacons (like the Vinktar map ones) that follow a player around, larger flameblasts that players have to dodge, multi-curse clouds, blue Xoph-Flame beacons, things that poses serious threats. Third, Harbinger spawns/types lack diversity and danger. I'd really like to see "unique" harbingers who can spawn different enemies. 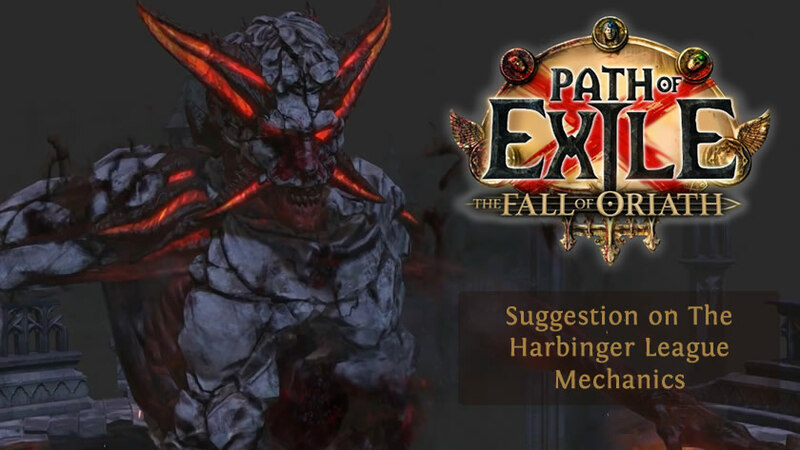 For example: Rogue exiles, Harbingers who summon beyond demons, Harbingers who summon ghosted mobs, Harbingers who have 3x the AoE, but don’t cast spells, Harbingers who summon many small circles, Multiple harbingers who channel and summon Malachai together. Fourth, the unique piece mechanic has so much unused potential. A big part of what makes other league encounters so interesting are the unique item rewards - there were 30+ new uniques in breach. I know harbingers are just a small league - but it feels like it has so much wasted potential. For instance - there could be different pieces that combine into slightly different unique variations with varying mods. On top of that I think "normal map" harbingers should have a tiny chance to drop a piece too. Fifth, chaos is the only "good currency" you can really rely on Harbingers to drip feed you earlier/faster than you'd otherwise get them, and only while leveling. Once you're mapping, chaos and things worth chaos are so much more common that the shards start to feel less worthwhile, but the shards for the higher tier currencies are fairly rare. Sixth, the mirror shard feels bad. The best thing a harbinger can drop is a mirror shard but it pretty much never happens. Everything else is too small to be exciting. Even an exalted shard feels really lame. It feels very deterministic. You spend X seconds to get X shards. Meh. You also don't notice them at all. After a map players dump items into the stashtab. No-one notices the completion of an alchemy or chaos orb. Seventh, older leagues generally had better rewards, but no one complains about that that much (unless you're comparing Harbinger to Breach, which isn't really a fair comparison tbh). Most of the complains are regarding Harbingers themselves. The reward is too little. All in all, although the Harbinger League has some aspects which need to be improved, but the game is still worth trying. After all, it is safe to say the game is one of the popular games in the world because only popular games can raise so many debates.